"We used your 2-inch SCA collimator to help bring our 15-inch Obsession Dobsonian telescope back into service. The telescope was initially so far out of collimation that the laser beam reflected off of the primary mirror didn't even reach the secondary mirror at all. That was easily fixed and the magic of the SCA made final collimation a breeze. The star images were excellent and the telescope was enjoyed by a group of about 50 people under wonderful skies. I confess that I had never used a laser collimator before, but using the Hotech laser collimator was much easier than I had imagined. I now know that it is a fantastic tool that makes it easy to keep a telescope in tip top shape for observing." I have never recommended one astro product over another and I have been doing astronomy for about 50 years. I have no connection with any vendors, but when a product comes along like the HoTech crosshair laser collimator, I feel that I should share it with other amateur astronomers. It is fast and easy to use in 2 inch or inch and a quarter inch focusers and on any size reflector telescope. I have had mine now for 2 yrs. and still going on the same battery it came with and I have done most of the scopes in our club and that is a lot. 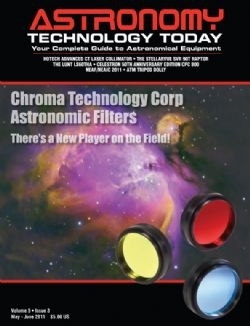 HoTech has a real winner here and I will break with my 50 year policy and recommend it to all amateur astronomers. Any new or seasoned astronomer can use it with confidence and it will do the job. Thank you for reading this review and recommendation. "This is a very clever device. By using three perfectly aligned laser beams it simulates the parallel rays coming from a distant star. The beams then pass through the telescope twice to amplify any error in the entire system making even small miscollimation errors readily seen and fixed. David's done his homework on this one, coming up with a very ingenious answer to daytime collimation of an SCT." Excellent reference article and illustration on "C11 Mechanical Alignment & Collimation." Read the complete review from Andrew who is an engineer work at the W.M. Keck Observatory on the Big Island of Hawaii. I'm just writing to let you know what a wonderful tool the SCT Collimator is! Two hours of meticulous set-up led to exactly 8 minutes of collimation work. Once the principle is understood, the process is flawless. Once I recognized what was happening- a true Eureka moment- I was delighted. So if you want to avoid shipping off your SCT and paying big bucks to UPS and worrying about the safety of your scope and suffering through a month or more of downtime, check out the Hotech SCT Collimator. I have a Mewlon 250S permanently mounted in a dome. I have used Mewlons, both the 250 and 300 for years and and found them superb scopes, but sensitive to precise collimation. This is somewhat mitigated by their ability to hold their collimation over long periods. Over the years, I have struggled with collimation as my location in NJ is in an area where the local mountains and upper air winds tend to produce a great deal of turbulence and with the extremely high housing density, I am surrounded by a massive light dome. This all makes the standard collimation technique of using a star at high power, virtually impossible. Therefore, I have tried almost every collimation device on the planet, from Glatter Lasers to Catseye devices, normal lasers to holographic, even the optical techniques recommended by Texas Nautical. With the exception of TNR's technique, none of the laser devices had sufficient accuracy to truly nail down the collimation of the Mewlon, and the TNR technique requires distance that is difficult to obtain and requires good weather. At NEAF 2010, I had the chance to see the laser CT collimator, and with prior knowledge and use of double-pass collimation systems in my youth, this seemed ideal. I purchased it on the spot. The timing was perfect as recently I had obtained the new Mewlon 250 corrector and on installation found it to be everything Takahashi has claimed for it but it came with one issue. The collimation was now a bit more sensitive than before, making my issue worse. I followed the instructions for the collimator, but hit only a few snags. The manual referred to using the Telescopes fine adjustments, but there were none. From what I can tell, the adjustments were mount adjustments, not telescope. Trying to use the outside tags as targets was extremely frustrating, but on most mirrors, the edge is beveled. I made a template and marked 4 fine black lines using a fine sharpie on the beveled outer edge. These could be seen from the from of the Mewlon using a dim flashlight, while still being able to see the lasers. An additional mounting plate that allowed me to mount it a the proper height and provided a wider base to secure the base of the collimator to the fine adjust adapter HoTech supplies, and all was well to go. It should be noted that the fine adjust adapter is a very nice touch, as in my case, using a tripod was not possible, however the adapter can be mounted on almost anything, giving a great deal of flexibility. Ready to go, I quickly found out the first part of the learning curve. While it is clearly mentioned in the manual, I will repeat it here. The MOST important thing is to get the optical axis of the scope absolutely dead-on square with the collimator. Without that, you will never achieve good results. While this sound easy, and is probably much easier with a SCT with a Alt/Azimuth fork mount, on a German Equatorial, the axis's don't move up/down, left/right just like a tripod does. The axis's move in arcs, so getting the collimator square is a operation in which you should expect to spend quite some time, unless you are lucky and hit it off quickly. getting from there to perfect, took time and patience. But any such collimation system (remember I had used this type years earlier) requires the optics to be square on, and Hotech deserves credit for coming up with a way to accomplish this in the field, not on a optical bench. Suffice it to say, the optical axis was now square and turning on the 3 main lasers showed 3 dots on the face of the collimator. Success! Or partial success, as the 3 dots were not all on the same line. This was my first indication of how sensitive the test is as the scope had been collimated earlier. It took about 15-20 minutes to get the dots as close to being on the same line as possible. I found the test so sensitive, that even the torque of turning a screw tight would shift the pattern and had to be compensated for. Once fully collimated, I screwed down my platform holding the Hotech, checking that all was still well. Now by just turning the scope back to the hotech, and a bit of tweaking, I'll be able to check collimation in no time. And I should mention that this entire experience was done, inside my dome, while it was pouring rain outside. Nice, very nice. perfect alignment. Views were crisp across the field with excellent contrast and definition. This is a real breakthrough device. The first device I am aware of that really works for scopes whose primaries are fixed, works day or night, indoors or out and requires so little room, it can fit in a small 10ft dome with a relatively large scope and mount. Its accuracy is amazing, and the ability to simply watch a screen while you tweak screws until the pattern is correct, takes collimation from an art, to a simple maintenance exercise anyone can do. to help solve certain difficulties he might run into. These are minor points, and ones that I expect will be dealt with as the product matures. The key is that I had NO real issues with the main hardware or its performance. I heartily recommend this device to anyone, even seasoned "pros" as a way to collimate without wasting you previous night hours and to collimate at least as accurately as most star tests, and certainly a way to collimate in areas and during conditions where a star test would be impossible. The Advanced CT Collimator is a very valuable tool for my C-11, and very accurate. Thank you. The circumference of the C-11 is too big for the supplied measuring tape, so I assembled the tension belt under the Losmandy plate where I could, near the rear of the scope, and measured off the 90's from a convenient spot to assemble the alignment tabs. I deliberately leveled the scope on its equatorial mount to perfect horizontal, and then proceeded to find coincidence of the center of the collimator with the center of the scope, to prepare for collimation. This was a difficult step, so say the least, because of the tripod mount configuration, and the use of the tripod in general. I was nevertheless able to tighten all of my collimation screws and achieve collimation as described in your manual. Star collimation was not too far off (1/16th turns, in my first go!). Congratulations. Many thanks for the SCT collimator which I have now put to good use. I really am very impressed with it indeed and it is a superb piece of kit and I felt that I just had to write to you to express my appreciation. I have a Meade LX 50 and although I knew that it was in pretty good collimation already, our weather here on the West Coast of Scotland is never that steady and I could never get an accurate enough star test to get the collimation 100% correct. However your collimator has done the trick and not only that, but it has had unexpected advantages as well. I have a Rolloff Roof Observatory and I have set up the collimator on a tripod head hanging down from the roof of the Observatory so that it does not move when I walk on the floor and this has made it completely stable. When I first set the collimator and the primary mirror parallel to each other, I noticed that the spot created by the in focus image of the three lasers did not quite hit the middle of the eyepiece mirror and this was clearly seen since you have kindly provided a stick-on concentric paper target to go over the end. It was not that far out but I traced it down to two things. Firstly, my FeatherTouch Crayford focusser is attached to the rear of the scope by three set screws and I found that by slightly slackening these off and re-tightening them, I could get the return spot to be bang in the middle of the paper target. Secondly, I found that my 2 inch diagonal moved about when I tightened up the two set screws on the focusser. I tracked this down to the fact that the two set screws were not evenly rounded off on the ends and now all is absolutely perfect. Strangely enough, it did not make that much difference to the collimation and it only needed a little tweak to bring it back to 100%. Your SCT collimator is not only excellent for actually performing a very accurate collimation but also it is very useful for diagnosing any other misalignments in the optical axis and I cannot see how this could possibly be done with a single laser. I am sure you will be getting more superb reviews soon! A couple of days ago, I also used your laser collimator to collimator my 2 inch mirror diagonal (Williams Optics). All I did was to collimate my scope straight through without the diagonal, note where the spots returned to on the face of the collimator and then insert the diagonal and see by how much the pattern had shifted. It was then a fairly simple matter to shim the mirror in the diagonal to bring the spots back to exactly where they were when I collimated straight through. All it took was a very thin piece of paper under one corner of the diagonal mirror. I cannot see how I could have done this on my SCT with any other device apart from your laser collimator. It is also very interesting to see how much mirror shift affects collimation - in my case, by not much at all. In fact, your laser collimator is a fantastically useful instrument for diagnosing all sorts of problems with the alignment of SCTs, not only collimation.